I'm lovin' this double neck stuff around here as of late. Very interesting to see the bass double neck...with the bass neck on the bottom for the young lady on the album cover, and the bass neck on top in Mosriteforever's picture. Thanks again Bill for finding this! If anybody is interested in purchasing the least practical and perhaps ugliest Mosrite doubleneck, it showed up on craigslist this morning. Have at it! Still think my double neck standard/baritone would be much more useful to playing retro style surf and garage. Imagine those rich bari-chords and riffs (Twin Peaks meets Jack Nitsche meets Duane Eddy)supplimented by leads played on the standard neck. For some reason, this really appeals to me. Anyway, bring on the double necks!! Notice anything unusual about the pickups on Larry Collins double neck? These appear to be P90s. Look at the two extra screws between the poll screws, plus check the width of string spacing. 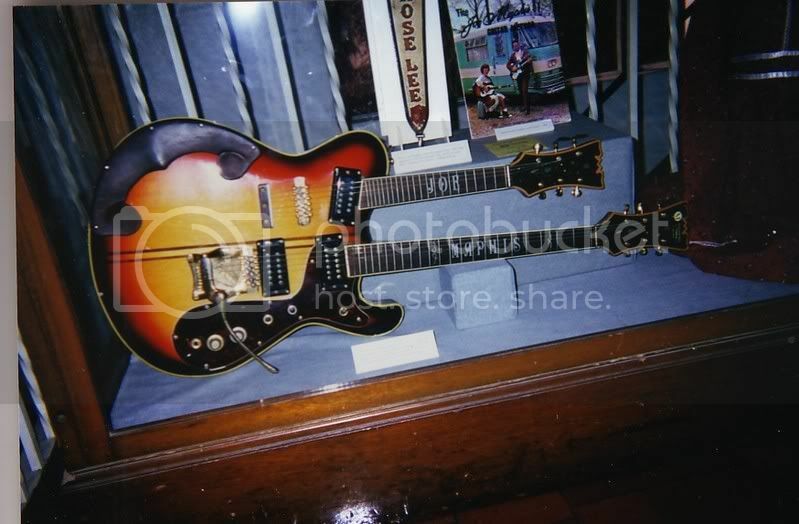 Did Larry opt for Gibson type P90s on this guitar? I hope this doesn't double post. I did this same thing a few minutes ago and nothing happened. According to Larry Collins, the pickups on his guitar at present are the Hallmark AP-6 colones. I think Bob Shade could confirm. Yep, Carvin pickups having the mounting screws in between the E and A and the B and E strings. P-90's have their mounting screws between the A and D and the G and B.
Deke Dickerson wrote: If anybody is interested in purchasing the least practical and perhaps ugliest Mosrite doubleneck, it showed up on craigslist this morning. Have at it! This one showed up on eBay a few times but never got any bids... I wonder why? 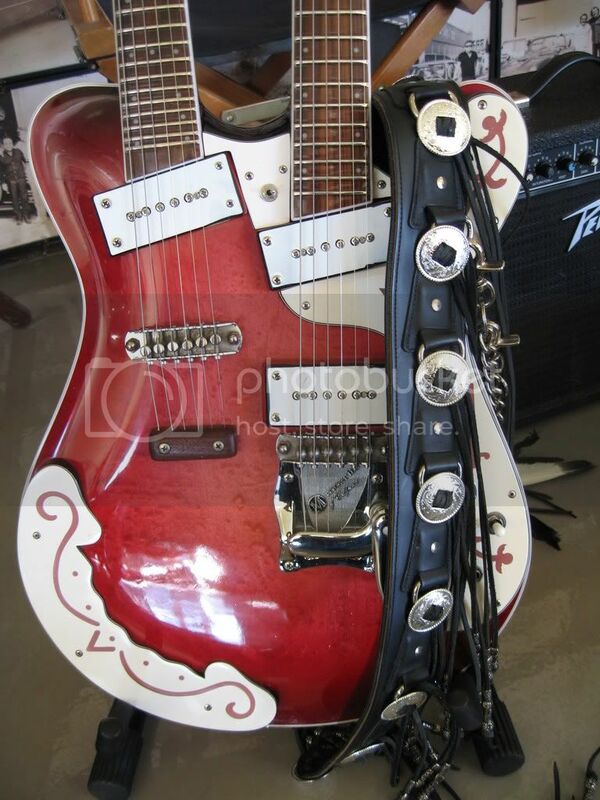 oipunkguy wrote: has anyone ever seen a 12/6 double neck from the early 70's with mosrite humbuckers????? Oipunkguy, Deke posted a pic which confirms your 'sighting' back in 2001 .